To do that, I put Eudora down and go take care of Norton. Then I feel guilt over that. 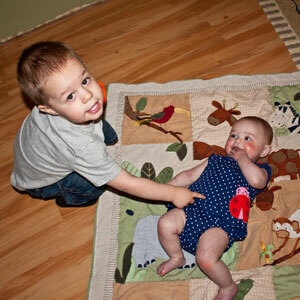 What kind of message am I sending to my daughter by putting her down to tend to her brother? She seldom cries over it (unless it’s her first bottle of the day), but still. I feel like I’m telling both of my children that Norton is more important and his needs come first. In contrast, I’m telling Eudora that she is not as important as her brother. Or that I don’t love her as much, or that she’s just… somehow less. I don’t want my daughter to ever feel that she’s less important. She’s loved. She’s treasured. She’s our little wonder; she’s the little girl that my in-laws have been hoping to have. And she’s so very important. Once she was born, my husband and I both felt that our family was now complete. But there’s that guilt. There’s that fear that I’m doing some sort of psychological damage to my daughter and setting her up for years of mistreatment. There’s that fear that I’m creating a spoiled, entitled little boy because I try to avoid both the toddler tantrum and the infant crying that follows. But what else can I do? How do you handle it when your children have seemingly conflicting needs? it happens with my niece regularly.. and shes an ONLY child… you let the toddler have his tantrum. if hes old enough, encourage him to be more self sufficient. if he cant find Pillow, enourage him to look in different places, different ways. he needs more milk or down from the table, well manners say you wait until someone is able to help. in the meantime he can learn patience… a very very important skill. my niece is quickly learning that gramma or mom will not drop everything they are doing to cater to her every whim. she is not yet 3, but knows that if she wants water, it comes from the tap, and theres her cup, and theres the step stool, and to help herself. Oh momma! That is the story of sibling rivalry at it’s very beginning. Children will compete for the attention of the parents to whatever lengths necessary for their entire lives. I believe that you must do what is best for you because your sanity is what will hold everything together. If it takes you putting her down each time to tend to his needs, to keep your home calm then do it. Though as a soft warning, by you doing this he knows that his tantrums are working and will continue this behavior for longer than you would like. There is no solid in parenting. That is the hard truth. If you discipline him by time out instead of giving in, you will feel guilty for tending to your infant. If you continue to give in to your son, you will guilty there as well.